Have you got a high-tech kid? 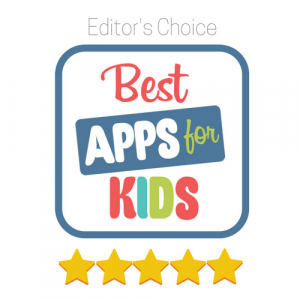 Keeping up with electronics for your preschool or school-aged child can be expensive, so you need to protect that investment. 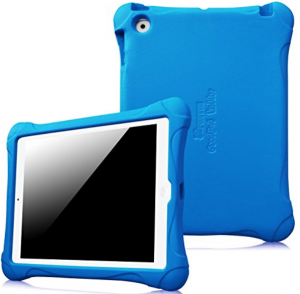 Here are some of the best cases for iPads for you to check out. 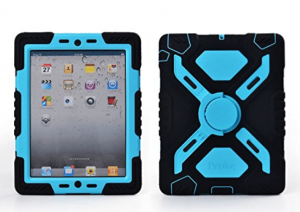 This sturdy case is built rugged-tough for kids with iPads 2 through 4 (not mini or air). It comes in your choice of seven kid-pleasing colors and features a rigid case with foam cushioning to handle the bumps and bangs that are likely from little hands. The rotating handle is a great feature and it folds into a handy stand, as well. The surface is non-slip, making it perfect for use at home or at school. The case is designed to be tricky for a child to remove, but relatively easy for adult hands to manage. 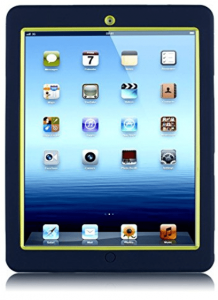 Check out this rubberized carrying case for iPad 2/3/4. The brightly-colored cases (THIRTEEN color choices!) are sure to appeal to kids of all ages and genders. It’s sturdy and lightweight, which is a real plus for the youngest users and for users with special needs. The case features a carrying handle that is sized for small hands, and a handy built-in stand that holds the device at great angles for typing and for viewing. The fit is snug, but easy-to-follow instructions for putting the device in and out make parents’ lives easier. 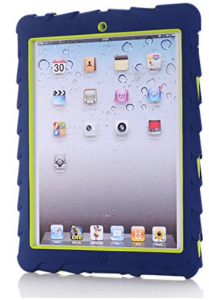 The Pepkoo case offers a built-in screen protector and a silicone cover that feels nice on kids’ hands. It’s got a handy kickstand that holds the device in the best position for video viewing and Facetime interaction. Users, such as classroom teachers, have been pleased with the case’s durability, comparing it to some of the most sturdy cases on the market that cost a whole lot more. One drawback is bulk, but it’s a small price to pay for a case that fits well and holds up like a champ. This case’s claim to fame is its extremely light weight. It checks in at just under half the weight of most of the other kids’ cases, making it easy for the very young to handle. It also is a plus for kids who are carrying their device to school in an overloaded backpack or bookbag. This case comes with a separate screen cover if you want to use it, but many users seem to be just as happy without it. Perhaps the most striking theme in the comments was how many adults use this case even though they have no children! Reviewers cite great position of the openings for buttons and ports, as well. Check out this case’s unique carrying handles. No matter what angle your young child grabs from, there’s a handy way to hang on to the device. It comes in a rainbow of gloriously bright colors that are sure to please young users, as well. The case features a unique contour that allows the device to stand up easily. The handles are nearly two inches away from the device, too, so there’s lots of room for inexperienced little hands to grab and go. Here’s a case that has just about the highest praise that a reviewer of children’s iPad cases can offer: “It bounces well”! Every parent worries that their child will drop the expensive tablet and damage it, but this case will eliminate that worry. This lightweight case features a squishy foam cover that will protect the device and be fun to feel and use. 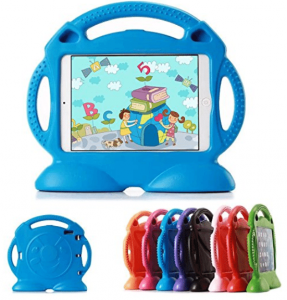 The handle folds up so kids can have hands-free viewing when they are watching videos. It’s bright lime green (though it does come in other colors), which makes it hard to lose in the toy jungle. Check it out! 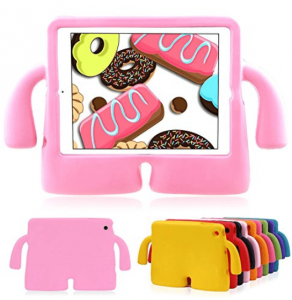 This kid-friendly case features a unique handle and stand-up design that makes it perfect for the youngest users. It also fits iPad 9.7”, which is a bit unusual for cases that also are the right size for the 2/3/4 models. Access all ports, buttons, and the rear camera through cut-out holes. It includes a screen protector if you wish to use one, and it comes in a wide array of kid-pleasing colors. 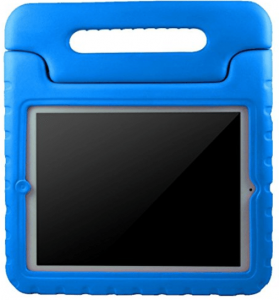 Protect your investment in iPad 2/3/4 with this smart case that is designed to withstand the bumps and wear of classroom use. Amazon reviewers commented on the ease of installation and how easily the screen protector can be applied. The simple design holds up well and is very sturdy. It has to, for classroom use. After all, imagine twenty or thirty youngsters using the same iPad! 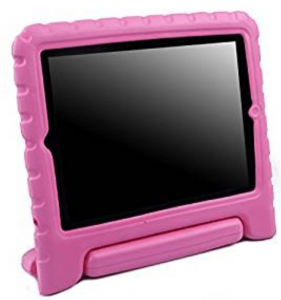 It’s a good option for a low-cost, effective protection for your child’s tablet. 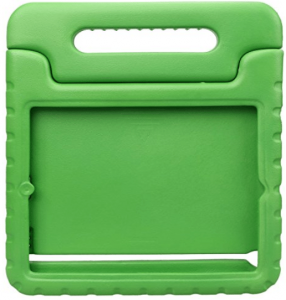 This case will protect the iPad on the go. It comes in a variety of somewhat muted and pastel colors, which will please most children. The case features port covers that protect the input areas from dust and damage from incorrect things being inserted, yet all are easily accessible without removing the case. 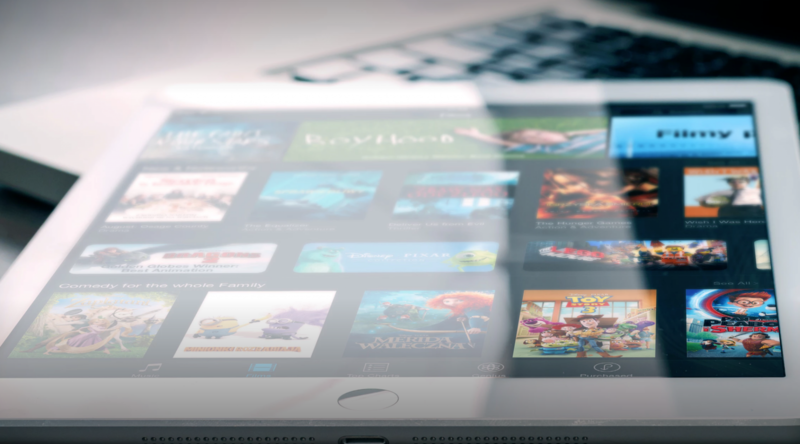 The product comes with an adhesive screen cover that will protect your device’s screen from dirt and scratches. The case does add some noticeable extra weight, but then most do. What counts is performance, and most reviewers put this one up there with the more expensive options. 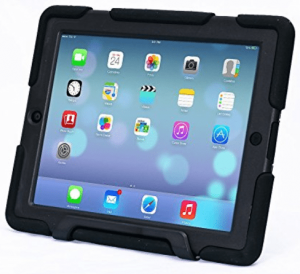 This sleek black case will get the job done if you need your iPad protected from shocks, bumps, bangs, and unfortunate tumbles. It comes in some other color combinations as well, including pink cammo and blue with black. The case features a built-in kickstand to hold the device for typing and for viewing. It also comes with a 12-month guarantee, so your investment is protected.